Well, it is official now - in addition to the Great Wall, the Great Traffic Jam started on Aug. 14--60 miles and ten-day long on an "expressway" into Beijing from Inner Mongolia (see map)--has earned the capital of China the top spot among the cities with the world's worst traffic…, at least according to Foreign Policy. Until recent years, China was able to maintain growth despite its inadequate infrastructure; however, this is not the case anymore. While the world seems quite fixated on the length--miles and number of days--of these mega jams near Beijing, there's also a serious message--the under-capacity of China’s infrastructure. Both super-sized gridlocks reportedly were caused primarily by heavy trucks transporting illegal coal, compounded by road maintenance works. China is the world's top producer and consumer of coal. However, with limited rail lines, China's roads often suffer from the spillover of illegally overloaded trucks, especially along key coal regions. 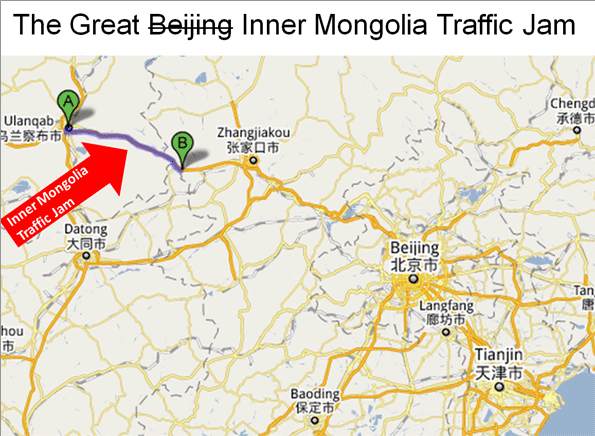 And Inner Mongolia is an important coal producing region in north China. 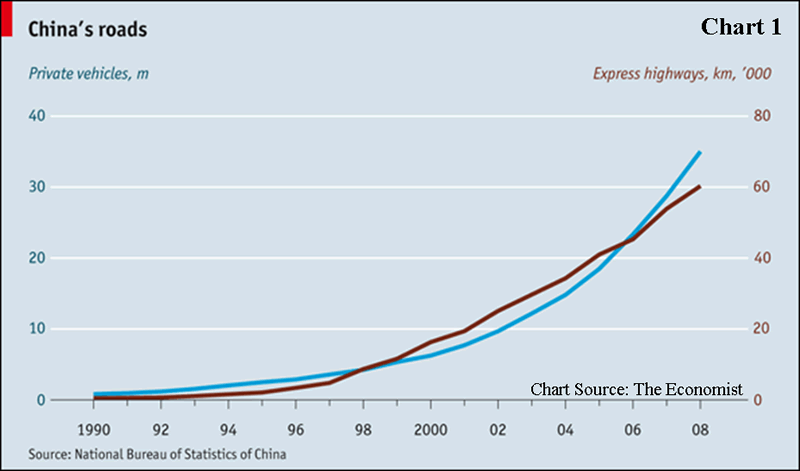 The per capita railway mileage in China is estimated to be only 6 cm--shorter than a cigarette—and remains below those of developed economies. In addition to commercial lines, the inadequate rail network also has been causing serious passenger travel headache, particularly during the annual spring festival migration. Cognizant of the crucial link between infrastructure and economic growth, China is keen to catch up. 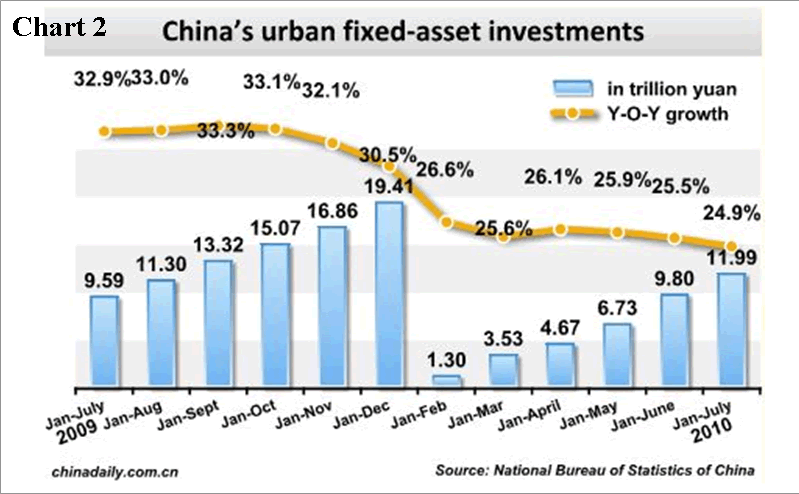 Infrastructure investment was the cornerstone of China's economic growth last year. In 2009, China pumped $102.7 billion of investment into railways, an increase of 69.1% year over year, with high-speed passenger rail lines accounting for almost 60%, according to the report released this April by China's Ministry of Railway (MOR). The country already has the world's largest high-speed rail network with 6,920 km of tracks, and is planning to lay down 42,000 km of new rail track by 2020, much of it completed by 2012, adding new high-speed rail lines between major cities. 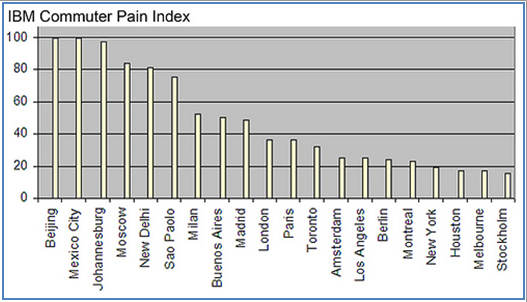 Even without the latest headline road congestions outside the city, Beijing already has taken the top spot in "Commuter Pain” among major world cities based on IBM's latest survey. And that’s with 44% of the respondents in Beijing taking bus to and from work, based on the same IBM survey. The ranking is of no surprise. According to Newgeography.com, by 2008, Beijing has reached a car ownership rate almost equal to that of New York City dense boroughs, but with 1.5 times as many drivers per household. The city of Beijing is not along in this predicament as other cities in China are also facing growing congestion headaches. Bloomberg reported Chinese vehicle ownership climbed 51-fold, while per capital disposable income for Chinese households increased 46-fold in nominal terms from 1977 to 2008. Somewhere along the line, China dethroned the U.S. as the world’s largest auto market when its automobile sales zipped past the U.S. for the first time in 2009, when its total car sales hit 13.6 million vehicles, up 46% from 2008. China is racing to build new roads and has embarked in recent years on a huge expansion of its national road system. Nevertheless, the road upgrade and expansion has failed and to keep pace with, and will continue to lag behind the rising car buying and driving population (Chart 1). And the latest data offers few contradictions to this great auto boom. China's car sales in August rose 55.7% on the year, as renewed subsidies for energy-efficient vehicles and a stronger yuan currency spurred demand. Jeffrey Shen, CEO of Ford Motor China this week told Reuters that he is projecting auto sales in China this year to grow by 15-25%, after a breakneck 45% rise in 2009. China is going through a "growth normalization" phase after the Great Stimulus (4 trillion yuan) of 2009, and there are worries of a slowdown, even crash, partly as a result of the high base last year. However, Chin’s “normalized” growth forecast is still in the 8-10% range for 2010, and growth is becoming more broad-based as domestic consumption growth has strengthened since 2008. As opposed to the chorus of Chinese overbuilding bubble focusing on some overhyped planning misses not representative of the overall picture, China essentially has to keep expanding and upgrading its transport infrastructure (road, rail, ports, etc.) just based on the basic law of supply and demand, regardless of its monetary policy. In order to stay competitive while meeting future social economic development needs, China will likely keep a strong commitment to accelerate its infrastructure development for years to come (think the next decade, minimum) just to play the catch-up game. Furthermore, the recent world headline grabbing super traffic jams have put the number two economy in the world in a somewhat negative spotlight. I'd suspect Chinese government would most likely accelerate and re-appropriate funding and projects just to rid of this not-so-favorable image and press. Although they are not covered in this discussion, infrastructure expansion will likely also continue in other developing regions like India and Brazil, in addition to China. This trend should provide good long-term growth prospect up and down the entire infrastructure supply chain from raw material, equipment to construction companies like China Railway Group, China Railway Construction Corp., Caterpillar (CAT), General Electric (GE), CNH Global N.V. (CNH), KOMATSU LTD, and VOLVO Group. There are also some infrastructure-focused ETFs that could give individual investors some broad coverage such as iShares S&P Global Infrastructure Index Fund (IGF), SPDR FTSE/Macquarie Global Infrastructure 100 (GII), PowerShares Emerging Markets Infrastructure Portfolio (PXR). INDXX China Infrastructure Index Fund (CHXX), and Global X China Materials ETF (CHIM) are examples of funds specifically focusing on China.